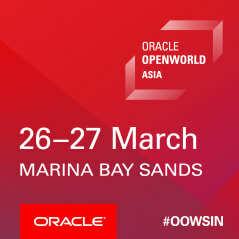 Bring the future into focus at Oracle OpenWorld Asia, held in Singapore in 2019. Gain enterprise expertise and start-up ingenuity directly from experts across retail, manufacturing, financial services, technology, the public sector, and more. Join innovators as they challenge assumptions, design for better outcomes, and leverage transformational technologies to create future possibilities now.